After a long hiatus for much of the ’70s, ’80s, and ’90s, cinematic musicals have returned to occupy a regular spot on the movie calendar. For the past decade, most years have seen the release of a big, splashy Broadway adaptation or a retelling of a famous musician’s life featuring an uncanny impersonation. These popular genre variations occasionally turned up in previous decades, but both the Broadway adaptation and the musician biopic have proved potentially lucrative and award-friendly enough for more consistent studio attention following the success of movies like Chicago and Ray. This year, for example, boasts four, with Get On Up taking on James Brown, Annie and Into The Woods hitting screens for Christmas, and Jersey Boys pulling double duty as both a Four Seasons biopic and a stage-to-screen transition. Thankfully, 2014 has also seen a bumper crop of movies that dig deeper into musical experiences. Most of them aren’t musicals, exactly, but they offer a collective respite from the over-designed magic of Broadway and the Boomer Hall Of Fame approach of most rock movies. The young musicians of Lukas Moodysson’s We Are The Best! couldn’t be further from any kind of hall of fame; two-thirds of them barely qualify as musicians at all. The movie, based on a semi-autobiographical comic book by Moodysson’s wife, Coco, follows a trio of early-teenage girls growing up in Stockholm. Withdrawn Bobo (Mira Barkhammar) and more aggressive Klara (Mira Grosin), both outcasts, are steeped in punk culture and zines, even though Klara’s older brother tells them that punk is dead. They start a makeshift band more or less out of spite, to steal the practice room from some older boys at a youth center, and eventually recruit their classmate Hedvig (Liv LeMoyne), a gifted guitarist, to teach them more about instrumentation. The lynchpin of their small repertoire is “Hate The Sport,” a song about the pointlessness of gym class, composed largely while running laps during said class. As the tossed-off (if impassioned) lyrics of “Hate The Sport” indicate, We Are The Best! constantly undermines the expectations of movies about young people forming bands. Bobo and Klara initially want to work up their song in time to play their school’s battle of the bands; teachers inform them almost immediately that this won’t be possible. Later, when they get a shot at a sort-of gig at another town’s youth center, it’s almost an afterthought. Though Hedvig knows her way around the guitar, the girls in general play at being in a band the way younger kids might dress up as any number of professions. Yet, they never seem less than authentic for this, probably because Moodysson gets on their level, willing to follow their adolescent whims. In one of the movie’s best sequences, a plan to raise money to buy their own instruments turns into begging on the subway, which in turn becomes an impromptu feast when they realize they’ve made enough money for snacks, if not a guitar or drums. What Moodysson captures so beautifully when he cuts to the girls gorging on chocolate and chips is not the music or band itself but the way these constructs make them feel. Even then, their feelings aren’t limited to the exhilaration of hearing or playing their favorite songs (though there is some of that in their fandom, as they talk earnestly, excitedly, and firmly about which bands they like) but the agency their own song gives them. It’s exciting because so few movies about punk rock bother to look past the provocations or the historical impact to see the human emotion underneath. The scene where the band finally plays in public becomes a triumph of friendship and defiance more than performance. And it is a major triumph; this is one of the feel-best movies of the year. The formation of a band also composes the narrative of Stuart Murdoch’s God Help The Girl, in which 20-ish Eve (Emily Browning) takes leave of her hospitalization for an eating disorder and strikes up a musical partnership with James (Olly Alexander) and Cassie (Hannah Murray). Though Eve, James, and Cassie are, like the two main girls in We Are The Best!, friends before they become band members, their ambitions are somewhat more adult: Eve writes compulsively, portrayed as a natural songsmith, and James, though less naturally talented, already has a band (albeit one turning to shambles) when the movie introduces him. Cassie, who receives guitar lessons from James and songs to sing from Eve, seems happiest to go along for the adventure. Though the movie has a lot of fun with those adventures—adorable group boating trips, recruiting other musicians, discussing the band’s sound and having the “name conversation” James adamantly disdains—the question of how (or if) the band might take the next step into a musical career hangs over the movie. To some extent, the filmmaker himself serves as an answer: Stuart Murdoch writes songs and sings lead for the Scottish indie pop act Belle & Sebastian, and the movie, while neither jukebox musical nor literal autobiography, does connect to his life. Like Eve, Murdoch suffered from a medical problem as a young man, and early in his career felt torn between keeping his compositions small and homemade (a point of view represented in the movie by James, who insists on his Scottish heritage despite his English accent, and is happy to remain in Glasgow) and pushing for further success (represented, at least by the end of the movie, by Eve). But setting aside its less direct and more interesting way of dramatizing the psychology of a popular musician, God Help The Girl also works as a great musical in its own right. A lot of modern film musicals generate tension, intentionally or not, from the dueling influences of stage productions and music videos, the latter having elbowed into movie musicals’ cultural space sometime around A Hard Day’s Night and shoved them aside by the dawn of MTV. First-time director Murdoch, shooting on beautifully grainy 16mm film, assembles homemade production numbers that take advantage of the medium’s versatility, its ability to change costumes and settings in a snap, without playing songs over montages or confining them to on-stage performances. The characters in God Help The Girl really do sing and dance through their lives, to the best of their sometimes amateurish, sometimes surprising abilities, buoyed by a set of characteristically infectious and clever Murdoch songs. Though it’s more melancholy than We Are The Best!, the film feels similarly warm and celebratory. These two films maintain elements of darkness—Bobo’s alienation, Eve’s sometimes crippling eating disorder—but essentially thrive on the good parts of making music: bonding, self-expression, the joy of performance. Lenny Abramson’s Frank, while in some ways more of a comedy than 2014’s other music films, explores the sometimes esoteric, sometimes hilarious, often completely insane and futile aspects of that same process. Its point of view sticks with Jon (Domhnall Gleeson), another aspiring songwriter, who by chance meets up with, and winds up joining, a band fronted by Frank (Michael Fassbender), a man who wears a papier-mâché mask over his head at all times. 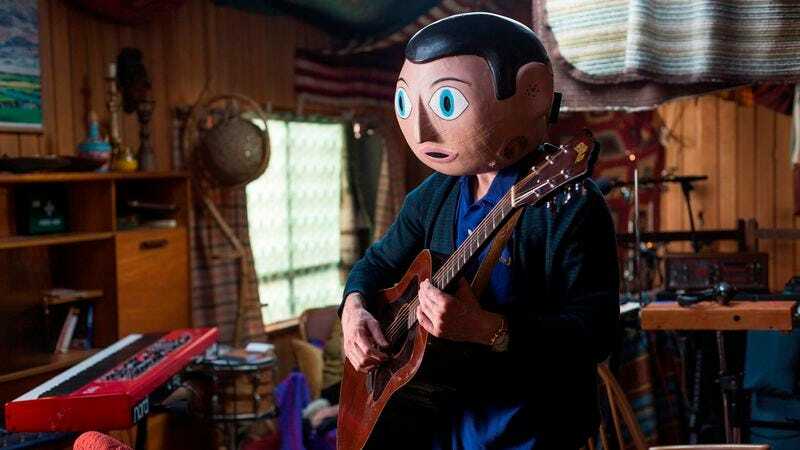 Frank sounds like a biopic of sorts, in that it’s inspired by the real-life Frank Sidebottom (alter ego of musician Chris Sievey). But while co-writer Jon Ronson knew the late Sievey, the screenplay is fiction, the man behind the mask invented for the film. By profiling a made-up frontman who may be brilliant but who may also be mentally ill, Frank frees itself from the musical-biography template of struggles, highs, lows, and comebacks. Jon eventually comes to think that they can achieve success as a South By Southwest buzz band; Frank’s own evaluation of any given situation comes to seem suspect (though always compelling, especially driven by the physicality of Fassbender, even without his handsome face). It’s rare to see a movie that looks at musical success (or lack thereof) below the superstar level, and rarer still to see one that lets the music itself be willfully, aggressively difficult—a chore to make and possibly even to hear. Odd versions of pop songs emerge from Frank’s strange and gifted brain, but they’re difficult, maybe impossible, to separate from his experiments. It’s the knowing flip side to a climactic failing of Begin Again to fully distinguish the pure, Keira Knightley-sung version of a song from the overproduced, Adam Levine-sung version. Frank offers an indie-rock equivalent: Frank’s accessible crossover tune is only a few degrees away from the Theremin-laden noise he presides over in obscurity. Gleeson’s Jon turns into the unwitting bad guy of the piece for his attempt to tease out the SXSW-friendly crossover. Of course, Jon’s ambition seems comparable to Frank’s compared to Andrew (Miles Teller), the sorta-hero of Damien Chazelle’s Whiplash. His desire for success kicks into such overdrive that Whiplash doesn’t necessarily register as a movie about forming a band or even about music—and indeed it isn’t, really, even though the point of the bloody, virtuosic drumming that Andrew practices is ostensibly to play as part of a jazz combo. Like Frank, the movie deals with a made-up musician in the real world; Andrew, a student at a New York conservatory, wants to be “one of the greats” like his hero Buddy Rich, and subjects himself to psychological torture at the hands of Terence Fletcher (J.K. Simmons), a sadistic teacher. Fletcher selects Andrew for his elite band, only to push, berate, and abuse him for his shortcomings, and Chazelle raises questions about whether this can really improve Andrew’s craft, and whether the trauma it may incur will be worthwhile. Even more so than the crazed-genius passages of traditional music movies, Whiplash paints the medium as a potentially isolating and unhealthy pursuit. Andrew doesn’t connect with a single other musician he meets; it’s arguable that he doesn’t really connect with a single other human being with the possible exception of Fletcher. In his intense practice and performance footage, Chazelle rarely leaves Andrew or Fletcher long enough to focus on the other musicians; more often, he cuts to them to show reactions to a screw-up. It’s music as gladiatorial combat, which means at some point, the movie has to declare a winner, even if it doesn’t make a definitive statement about the ramifications of that win. This is how Chazelle arrives at a final scene that’s equally exhilarating and chilling. The end of We Are The Best! is punk rock in its joyful abandon; the end of Whiplash is punk rock in its willingness to possibly go too far. This doesn’t mean that 2014 is the year punk rock broke at the movie theaters, forever diminishing staid past forms. In fact, a lot about these movies seems downright retro, from the Hard Day’s Night references in God Help The Girl to the jazz sounds of Whiplash to the actual period setting of We Are The Best! But together they do suggest that cinema is still learning how to translate the language of music, and mix it with film in ways that don’t involve Broadway or much-repeated rock lore. The upside to the number of uninspired music movies made over the years is the these four often feel, even in 2014, like hearing a new song on the radio for the first time.